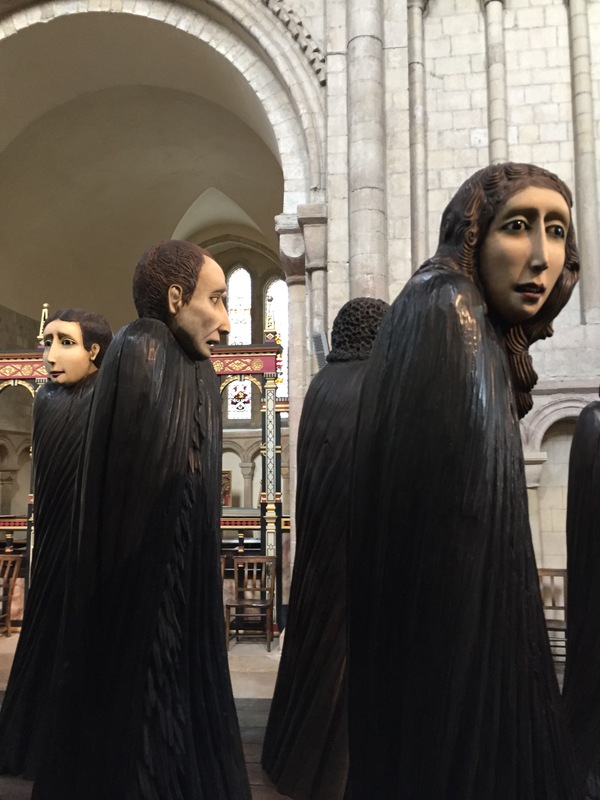 In the middle of the biggest and most heartbreaking refugee crisis in Europe since World War II, I came face to face with larger-than-life refugees in the middle of beautiful Norwich Cathedral in England. 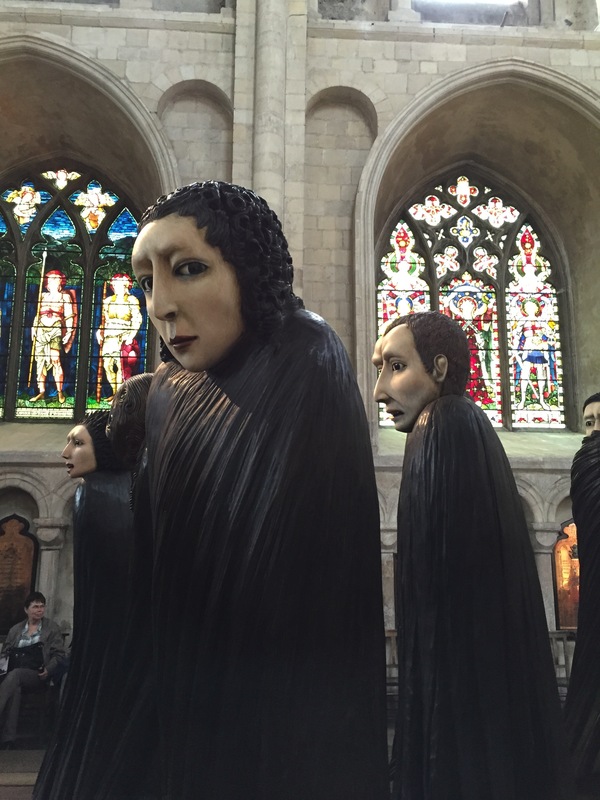 Ana Maria Pacheco, a sculptor from Brazil, had her ten-figure group on exhibit in the North Transept. The installation is called Shadows of the Wanderer. It was created in 2008. But it is especially powerful today, when people are dying every day in a desperate flight away from violence and grinding poverty in their home countries. The nations of Europe are struggling to come to terms with the vast number of refugees arriving on their shores and at their train stations. All over Europe and Britain, while governments dither, ordinary people get on with the business of helping their fellow human beings. They collect diapers, food, water bottles, blankets and tents, and they simply appear where they are needed. The lead figure in the sculpture group is a young man carrying his elderly father on his back. Father and son are carved from the same huge block of wood. The son literally cannot leave his father behind; his father is part of him, and he is part of his father. The origin of this stunning work of art was the story of Aeneas, who carried his aged father Anchises from the ruins of battle at Troy. The son is about to step off the exhibit plinth and join us, the viewers. How will we react to these desperate people? All the figures are larger than we are, about 7 or 8 feet tall. The situation they depict is bigger than we are, too. The remaining figures show possible reactions: Shock, dismay, disapproval, indifference. Will we look around, wondering who is going to get this problem out of our sight? Will we look the other way, complacent as we go about our regular business? The draped figures following the desperate father and son have their arms and hands hidden. If the father and son fell backward, would anyone catch them? Will no one reach out a helping hand? These are the questions that ordinary people are asking their leaders right now. Each one of us could become a refugee for reasons beyond our control. The current crisis is a test of our humanity. Norwich has one of the most welcoming cathedrals I’ve ever seen. Many great cathedrals charge admission, often as much as $15 or $20. At Norwich, visitors are greeted by volunteers asking what they are most interested in seeing. I’m sure donations are gratefully accepted, but I arrived late in the day and didn’t realize until after I’d left that I never saw a place to donate. 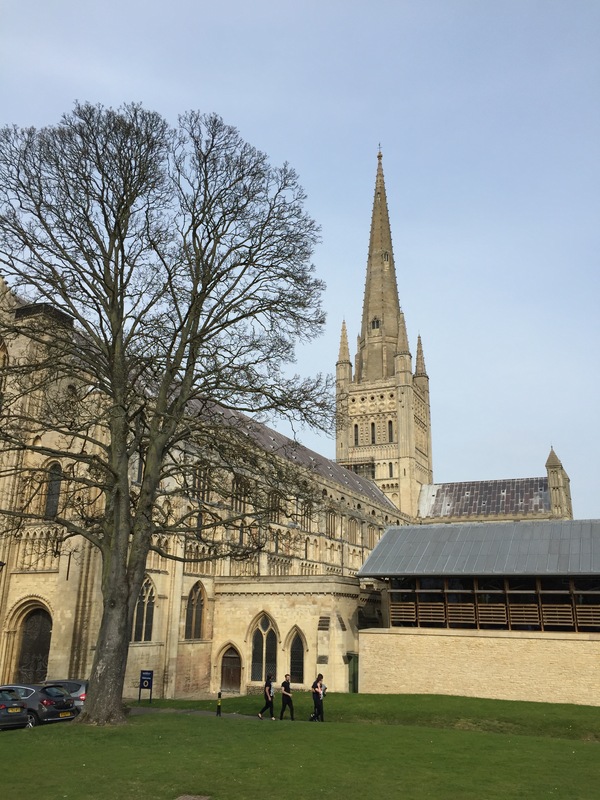 The business of Norwich Cathedral is to welcome and to minister to its visitors. When I arrived, a lovely young volunteer asked about my interests, then described this special exhibit. She offered to lead me directly to the North Transept so I wouldn’t miss this powerful work of art in my limited time. I am grateful to her. Join me next time for more explorations into the ever-fascinating and ever-challenging history and art of Europe and the British Isles. 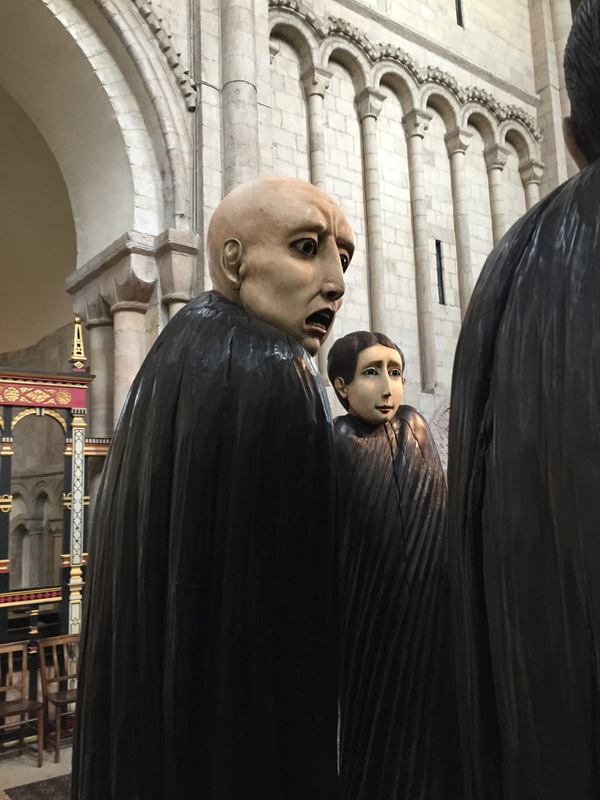 This entry was posted in Art, British Isles, Cathedrals and Churches, England, Why I Love England and tagged "Shadows of the Wanderer", Ana Maria Pacheco, European refugee crisis, Norwich Cathedral on September 4, 2015 by Claudia Suzan Carley. 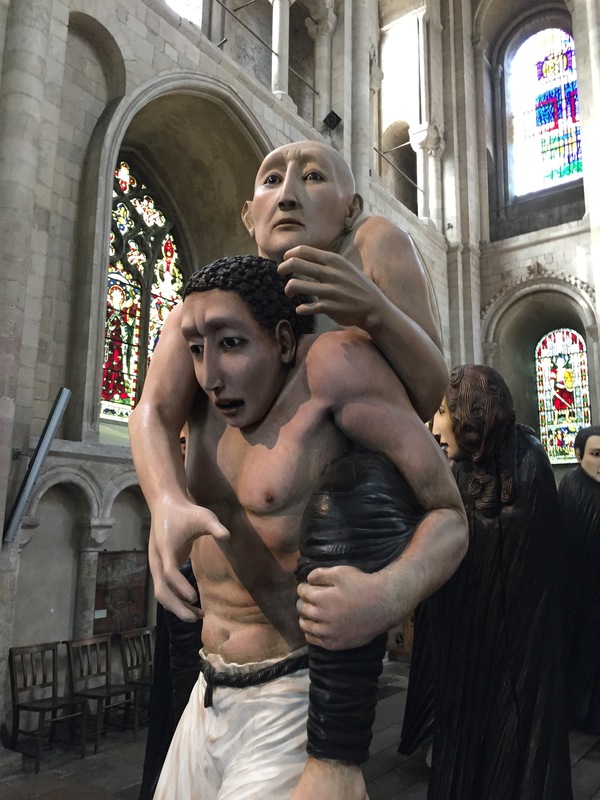 What a contrast between the beauty of the stained glass in the cathedral and the shocking stories told on the faces of the refugees portrayed in the statues/sculpture.